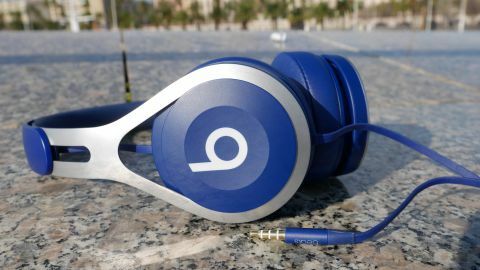 The Beats EP are Beats headphones for the masses. Offering a more balanced sound and cheaper price tag than their big brothers, they appeal while still offering that iconic logo that’s so coveted by many. They’re not perfect, but for the price they’re a solid offering. Beats is known for two things: bass-heavy sounds and lofty price tags, and while it might not always make the most well-rounded headphones, it certainly makes some of the most popular. The Beats EP are something different from the now Apple-owned brand though. Sure, bass is still given preferential treatment, but there’s a more balanced sound to these on-ear offerings. They’re also impressively priced, with their £89.95 ($99.95, AU$139.95) price tag making them the cheapest on-ear Beats by far, and the company’s first cans to creep under that all important $100 barrier. In the increasingly cable-free Beats collection, however, they’re a bit of an anomaly. While the rest of the line is shunning the cable, these Urbanears Plattan II rivals have fix it in. They mark a coming together of the old and new generations of Beats though, and one that actually thinks about users’ wallets. But at what costs has affordability come? The Beats look is an iconic one. Despite the usual costs though, it’s never been a particularly high-end finish, with plastic reigning king over more premium materials. Bizarrely, the affordable EPs have flipped things on their head. Well, sort of. There’s still plenty of plastic around the head strap and earcups, but the sparse design is blended together with a set of stainless steal arms. As well as creating a cool, slightly industrial look, these steal arms help ensure a reassuringly secure fit. They’re snug without being overly tight, and a bit of headphone-adorned dancing or light jogging for the bus isn’t going to shake them loose. There is a catch though, and a pretty big one at that. Flexibility is the headphone’s main shortcoming. Those stainless steel reinforced arms might be great for ensuring a firm, comfortable fit, but it also means they can’t be collapsed down and so take up a fair chunk of space when not in use or chucked in your bag. While pumping out sound though, the EPs sport a design that’s practical as well as easy on the eye. The heavily cushioned ear pads are seriously comfortable, with vertical sliders letting you find a fit that works for you. They might not create much of a seal around your ear, meaning a bit of unwanted background noise is able to creep in, but you can enjoy prolonged listening sessions without ear fatigue. Giving a bit of style-matching choice, the EPs come in four colours, with understated black and white models lining up alongside more attention-grabbing red and blue options. Sadly, that classic black and red Beats combo is missing from the colour palette. Whichever colour you plump for, the sound supplying cable locks into the left earcup. Annoyingly, there’s no option to pop out the 3.5mm jack and slot it into the opposite headphone. This means you’ll end up with cable trailing across your body if you usually carry your phone in your right pocket. There’s a lot of cable too. Excessive amounts. No matter how tall you are, you’re going to end up with lengths of bonus wiring - ours reaches our knee while stood with the connected phone in our pocket. Yes, this is better than coming up short, continually yanking the cable out of your phone, but a bit less cable would stop you having to bundle the excess into the pocket of your skinny jeans. The Beats EP’s design might do a good job of hiding the headphone’s affordable price tag, but their features list doesn’t. With no Bluetooth connectivity options or inbuilt noise cancelling, these are headphones that kick it old school, with a 3.5mm headphone jack and cabled volume control the only features of note to speak of. That doesn’t mean they skip on the sound though. They’re actually far more musically inclined than you might expect from a pair of Beats cans - a relatively affordable pair at that. No, we’re not looking at a rival to the likes of the Sony MDR-1000X or Bowers & Wilkins P7 Wireless, but there’s a pleasing level of crispness to the Beats EP’s sound. There’s no digital clipping when the volume’s cranked and there’s a better balance to the output than you might have expected. Listening to Nathaniel Rateliff’s ‘What I Need’, the strong bass line is solid without being overpowering, while the raspy horn sections are defined. They do tend to hiss out slightly as long, high tones hit their crest though. It’s not the broadest sound we’ve heard, but we’ve experienced much flatter sounds in and around the £100 marker. The mid-range can get a bit muddied an lost at times, but this is far from a crippling condition that effects all playback. It’s busier tracks with lots of layers that show the EP’s weaknesses. The synth line in Macklemore & Ryan Lewis’s ‘Can’t Hold Us’ fails to pop against the thumping bass drum, and layers some of the vocals on Ed Sheeran’s ‘Shape of You’ filling to land with the desired punch. Line these audio abilities up alongside a sub-£100 price tag though, and it’s hard to be overly critical. You can pay a lot more for a lot worse and will struggle to find anything overwhelmingly better in a similar price bracket. What you might find elsewhere though, are more playback options. Here, there’s no on-ear touch controls to get you skipping through tracks. There is still plenty you can do with limited controls though. The phone’s in-line play/pause button (single clicks) can also be used to skip forward (double click), skip back (triple click) and even launch your phone’s voice controls (long press), such as Siri on the iPhone. Android users will be able to make of the call answering abilities but, depending on their phone, might lose out with some of the other features. Price aside, these are some of the more balanced Beats headphones out there and a pair of cans that show progression. There’s enough bass for the low-end lovers without putting off those craving a more natural, balanced sound. The £89.95 asking price is a welcome addition too and although still not overly cheap, is positively bargain bottom pricing as far as entering the realms of the Beats brand goes. Although easy on the eye, the Beats EP’s design isn’ the most practical. The lack of collapsing arms is disappointing, but it’s the locked in cable that’s more annoying and restrictive. Yes, having an additional connection cutout would taint the sleek aesthetic, but it would make the EPs a more flexible on-ear option. These are the Beats headphones for the everyman. A more balanced, well rounded sound will appeal to the masses, while touches of the classic Beats look will appease those who demand their headphones are as much of a fashion accessory as they are audio enablers. No, they don’t offer the biggest or best sound experience you’re ever going to hear, but they’ll more than satisfy for most and comfortably hold their own against similarly priced competition. Yes, the likes of the Urbanears Plattan IIs offer similar sound quality at a cheaper price, but they’re not going to look as good wrapped around your head, and just like the smartphone in your pocket or wearable on your wrist, that’s a key factor for headphones. For the money, the Beats EP are hard to fault. There sound is solid without ever really wowing, and their design is sleeker than most sub-$100 headsets. You could easily play more for worse. For a look at the competition, check out our guide to the best on-ear headphones.